A bivalve mollusk, which is eaten raw or cooked. The Oyster's size, shape, texture and flavor will vary according to the area in which it is found. Their texture varies from soft to firm and their taste varies from bland to salty. The flavor of the meat is dependent on the characteristics of the region in which the Oyster matures. The salt content or minerals existing in the water has a major effect on the flavor of the Oyster, since Oysters filter large volumes of water in and out of their bodies daily. The construction of the Oyster shell (valve) is notable since it typically contains one shallow half shell and one deep half shell. When eaten raw or baked, the flatter half is discarded while the deeper half shell becomes the serving dish. Oysters can be eaten raw or cooked. 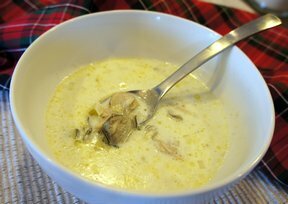 Cooked Oysters are prepared baked, broiled, sautéed, grilled, deep-fat fried, or slow-cooked when added to soups and other dishes. Several common species available are the Pacific (a.k.a., Japanese), the Eastern (a.k.a., Atlantic or American), European Flats, Kumamotos, and Olympias. The Pacific Oyster, which is a much larger Oyster than the Atlantic, is considered to be an inferior species for eating. It can grow to a length of 12 inches, providing a sizeable amount of meat for consumption. The Eastern species make up the majority of the Oysters sold in the United States, the most well known being the Bluepoint. Eastern do not provide the most flavor but they do have a sweet salty tanginess that is often considered tasty. European Flats Oysters, also known as "Belons" are meaty and unique in their complex flavor, being somewhat briny or salty flavored. Orignating in Europe, this Oyster is found in the U.S. as well. Kumamoto Oysters have a following in the raw Oyster bar restaurants, due to their mellow flavor and firm meaty texture. Native to Japan, this Oyster is found in the U.S. as well as other Asian countries. The oval shaped Olympia Oysters, which are are native to the Pacific waters off the coast of Washington state, are much smaller in size than other varieties, generally measuring 1 to 2 inches in length. 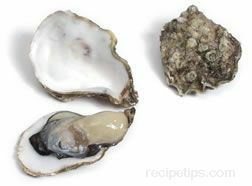 This Oyster provides a bland yet fresh flavor that is preferred by many who want a milder tasting meat. Other Oyster species that are common include any of the following: Beausoleil from New Brunswick; Pemaquid from Maine; Martha's Vineyard or Island Creek from Massachusetts; Tatamagouche from Nova Scotia; Skookum, Steamboat or Sunset Beach from the Puget Sound in Washington; Nootka from Vancouver Island in Washington; Malaspina from the coast of British Columbia; and Elkhorn from Monterey Bay in California. When selecting fresh Oysters in the shell, locate those that are alive and as fresh as possible. All Oysters to be eaten should be plump, consistent in color, and smell fresh, not overly fishy. A common belief is that Oysters should only be eaten during the months ending in "r." This belief is based on the theory that Oysters are spawning during the spring and summer months when their meat is softer and contains more fat, so they do not taste as good as they will from September to December. This concept has some merit and may be of value to consider when purchasing Oysters. If the shell of any Oyster being selected can be opened a little and does not close quickly when handled, discard this Oyster as well as any with broken shells. To store shucked Oysters or fresh Oysters in the shell, be sure to keep them lightly moist and cooled to 39°, making sure they are not placed directly on ice. When Oysters are purchased opened and shucked, they should be packaged in their liquor or juice, which must be clear, not cloudy. Before eating, examine the shucked Oysters for bits of shell that may still be attached. To shuck the oyster, use an oyster knife made specifically for the purpose of shucking. Wear a heavy protective glove to keep from injuring the hand when using the shucking knife. Holding the Oyster in your hand, locate the hinged area of the shell. Insert the knife at this point and move it around the shell, twisting it gently after making a complete circle of the shell with the knife blade. Begin to twist the blade to open the shell. Without letting the liquor (juice) in the shell spill out, remove the top half of the shell from the lower half. Whole fresh Oysters should be eaten within 4 days, while shucked Oysters can be kept for only 2 days. 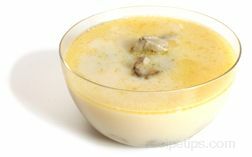 Oysters are also available canned, frozen, smoked, and dried. Champagne is the common beverage served with this shellfish, however, other types of wine such as chardonnay chablis and sauvignon blanc can also be served and enjoyed together. Heavy reds as well as many types of reds do not often pair well with oysters due to the tannins in the wine.